Help us educate the public by spreading the word about fair housing protections and the importance of reporting housing discrimination. This April, let’s act together to make a difference. Where you live affects everything else in your life: your health, access to education, opportunities for employment and more. To create a just and equitable society, we need to do more to eliminate individual and systemic discrimination that has historically limited peoples’ freedom to rent or buy a home where they want. The Fair Housing Act, passed in 1968 in the aftermath of the Chicago Freedom Movement and the assassination of Rev. Dr. Martin Luther King Jr., establishes protections against housing discrimination and aims to create equal opportunity in every community. In 2015, the Obama administration took an important step forward to strengthen existing federal law through the Affirmatively Furthering Fair Housing (AFFH) rule. AFFH requires local governments that receive federal funds to analyze challenges to fair housing choice and establish their own goals and priorities to address these barriers. At the beginning of 2018, however, the Trump administration suspended this rule until 2020. This step backward makes advocating to defend fair housing particularly crucial. What Kinds Of Housing Discrimination Complaints Are Commonly Filed? Nationwide, a total of 28,843 complaints alleging housing discrimination were filed in 2017. Those complaints are divided on the following bases. 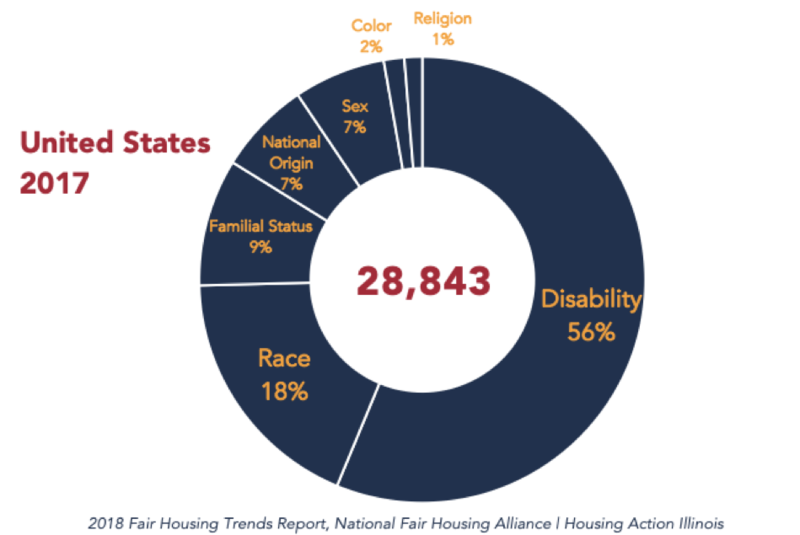 This and other data sources generally reflect that people with disabilities, who gained protections under federal law in 1988, are becoming more aware of and exercising their rights under fair housing laws. It’s important to remember that the number of complaints filed only represent a small portion of all the people who are impacted by discrimination and lack of housing opportunities. Lack of public awareness and lax enforcement of current laws are also major reasons why there are not more complaints. Have You Observed Or Experienced Housing Discrimination? Use Illinois Legal Aid Online to learn more about housing discrimination and identify resources to get assistance and/or file a complaint. Fair housing enforcement agencies in Illinois can give advice, and potentially help you navigate the legal process related to a discrimination complaint. Check back for updates on campaigns, proposed policies, and more events related to fair housing. The federal Fair Housing Act protects your right to rent an apartment, buy a home, obtain a mortgage, or engage in other types of housing-related activities free from discrimination based on race, religion, gender, national origin, color, disability and family status. The Illinois Human Rights Act also protects people against discrimination based on additional factors, such as sexual orientation and “order of protection” status. Some local governments in Illinois also have fair housing ordinances with additional protections. For example, the City of Chicago, Cook County, Naperville and Urbana require that all legal sources of income—including employment, retirement income, public benefits and/or rental subsidies such as Housing Choice Vouchers/Section 8—be treated the same in residential real estate transactions. A 2017 report by the Metropolitan Planning Council calculates that segregation costs the Chicago region billions in lost income, lost lives and lost potential each year. If metro Chicago were less segregated, it could see $4.4 billion in additional income each year, a 30% lower homicide rate and 83,000 more bachelor’s degrees. Additionally, downstate Illinois hosts some of the most segregated areas in the country with levels of segregation in the Champaign-Urbana, Danville, and Peoria areas remaining essentially unchanged since the 1980s according to a six-month study by Governing. Affordable housing located in high-opportunity neighborhoods, as well as in areas that have faced disinvestment, can help promote residential diversity, help children in poor families climb the income ladder, and remedy historical systemic inequities in community investment. In 2014, we successfully advocated for legislation extending the Housing Opportunity Tax Abatement Program through tax year 2024. The program provides an incentive for property owners in low poverty “opportunity areas” to rent a portion of their apartments to households using Housing Choice Vouchers. For many years, most recently in 2017, we have worked to pass a state law creating “source of income” protection in parts of Illinois that do not have it. We will continue to look for opportunities to make progress on the issue in the future. We have collaborated with groups to comment on the biennial State of Illinois Qualified Allocation Plan, which guides how the state allocates Low Income Housing Tax Credits to build affordable housing. Our focus has been on ensuring that more housing is developed in areas with good opportunities for employment, education and other resources that help people have successful lives. In 2018, we partnered with allies to oppose suspending the Affirmatively Furthering Fair Housing rule and subsequent efforts to weaken the rule. We will continue to advocate with allies for strong fair housing enforcement. We collaborate with partners to lead the Just Housing Initiative, a movement calling for a Cook County-wide amendment that will ensure that people with criminal records have equal access to stable housing opportunities. The criminal justice system disproportionally impacts African Americans and Latinos with over 60% of the prison population being people of color.